You should see that your gutters are cleaned and inspected every year to avoid dangerous and expensive problems. Gutters are difficult to reach and, as a result, the work of cleaning them can be quite dangerous. But if you leave them to fill with debris and dirt, you could be facing serious issues in the near future. We carry full liability insurance and have over a decade of gutter cleaning experience in Thornhill. We offer full eavestrough, downspout, gutter, fascias, and soffit cleaning services. 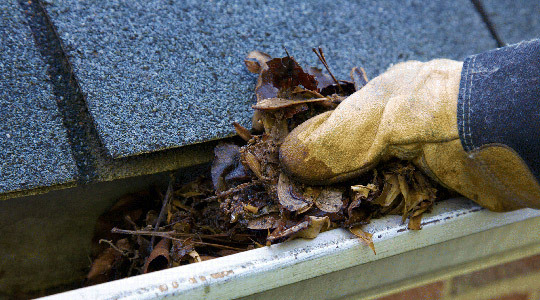 Clogged gutters actively disrupt the natural drainage of your home. This often results in damage to soffit, roofing, and fascia. The water can also leak into your home or foundation, which will result in extremely expensive repairs. The best way to keep your home safe from these kinds of damages is to have your gutters and eavestroughs cleaned regularly. We recommend using our services every spring and fall for the most protection. We even have an annual program so we come every year, so you never have to worry about booking an appointment again. Seal up leaks in your gutters, corners and joints. Our high quality sealant will help extend the lifespan of your whole gutter system. Install guards on your downspouts, which will help direct the flow of water. This one-time service will also help prevent excessive clogging. Flush out your eavestrough to inspect for holes and leaks. This service will ascertain exactly where your gutters are leaking water so we can fix small problems before they turn into bigger ones. At NICK’S Window Cleaning, we train our staff in two major ways to clean gutters. These methods have been tried and tested over our decade of cleaning experience and work to keep your gutters clean and working properly. The first cleaning method is by hand. Suitable for most residential cleaning jobs, this method is both precise and, when properly trained, most efficient. We can get every single bit of dirt and debris out of your gutters when we work by hand, meaning your gutters will drain better after the cleaning. For tougher jobs, like those after major construction or cleaning, we often use a liquid cleaner. This cleaner is extra tough on almost any kind of stain or mess. One quick application of this, combined with an expert scrubbing, will leave your gutters and eavestroughs looking like new. NICK’S Window Cleaning provides full gutter & eavestrough cleaning services in the Thornhill area, serving commercial and residential properties with a height of up to a 3 storeys. Our professional team will make certain that your business, house or other property looks excellent and has a clean gutter and eavestrough system allowing for effective and proper drainage of all rain water. Our workers are fully insured, exceptionally skilled, and very professional. Customer satisfaction is the absolute #1 priority of our service – you, our customer, are highly valued and we do our best to build long-lasting relationships and deliver exceptional high-quality services. If you need to have your eavestrough or gutter cleaned, just give us a call and find out why more Thornhill residents are selecting NICK’S Window Cleaning for their needs. A professional can get your eavestroughs cleaned quickly even if it’s been a year or more since they were cleaned. If you’ve been avoiding cleaning the eavestroughs because you know it’s going to be a tough job skip the effort and hire a professional to clean them. You’ll get the best possible cleaning and it will be done fast. If you have put off cleaning them for a long time they need to be cleaned quickly. A professional crew can get them cleaned out fast. If you haven’t cleaned your eavestroughs in a long time you already know they are going to be clogged with water, leaves, dirt and debris. There might even be rodents or insects living up there by now. Professional know how to deal with anything that they might find in your eavestroughs including rodents or insects. They have the right equipment and the experience to get your eavestroughs cleaned out thoroughly so that you can avoid damage to your home from clogged eavestroughs or downspouts. Mold is a serious problem that scares homeowners. If mold gets into your home it can cause significant health problems for anyone that lives in the home. Mold grows in eavestroughs because there is a lot of dirty standing water. All it takes is a few mold spores to blow up there and you’ve got mold. Professional clean out your eavestroughs and prevent mold from taking up residence in your home.